MODEL: E5472. Matching Pair(2pcs). 8.25% INSIDE TEXAS ONLY. Unit Working. Unit shows light scratching and signs of wear device wide. The pictures include everything that you will get. 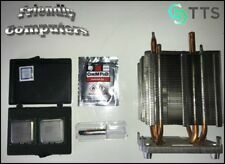 Matched Pair Quad Core X5482 3.2GHz XEON CPU DELL Precision T7400 kit heatsink. This is a CPU upgrade kit for the Dell Precision T7400. One Precision T7400 heat sink with screws. Yes that's 8 total cores. (Eight Cores). 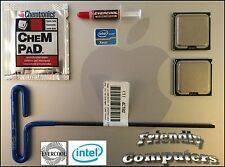 This is an upgrade kit for the 2008 Apple Mac Pro 3,1. One Chempad® for cleaning your heat sinks. One tube of Thermal Paste. One 3mm long handle Hex wrench. Warranty and other info. (12MB Cache, LGA775, 1600 MHz FSB). (A representative will respond quickly. The item you will be receiving will be labeled with part number SLBBH. Model Number: SLBBH. 5) 100% Authentic and genuine products. Why Buy From Us. Condition Detail: REFURBISHED. Model E5472. Rack & Rail Kits. Tape and Storage. ServerPartsFast is an independent distributor of servers and components located in Atlanta, Georgia. Our Promise. We Buy, Consign, and Recycle Servers. Part Number SLANR. Processor Number E5472. Include With Processor. Instruction Set 64-bit. This item functions as intended. This sale is for a fully tested, fully functioning Apple Mac Pro Matched Pair LGA771 Intel Xeon E5472 Quad Core 3.0 GHz/12M/1600 it will be delivered as pictured. If you have any questions, or require additional information please feel free to contact us through eBays ask seller a question panel. .
MODEL: E5472. TYPE: XEON. PLS CHECK COMPATIBILITY OF YOUR SYSTEM WITH RESPECT TO PARTS BEFORE BUYING. We leave no stone unturned to make you satisfy with our services. These are working pulls from a decommissioned server. Processor Number:E5472. The CPU in the pictures is the exact model and form as the one you will be receiving. Good luck. Instruction Set:64-Bits. Part Number SLANR. Product specifications. Reference the RMA number outside of box. Our servers and parts are tested for full functions, R2/Ready for Reuse. Check parts for our serial numbers before sending back. Part Number EU80574KL080N. Processor Number E5472. Include With Processor. Instruction Set 64-bit. LGA775 XEON SLANR E5472. (12MB Cache, LGA775, 1600 MHz FSB). The motherboard must support the system bus frequency of 1600MHz. Model Number: E5472. L2 Cache Capacity: 12MB. CPU Frequency: 3.0 GHz. We are committed to resolve all issues in a friendly and satisfactory manner. Core steppings: C0 (SLANR). 64-Bit Support: Yes. Warranty only apply on the stated warranty period products. Model Number: E5472. L2 Cache Capacity: 12MB. CPU Frequency: 3.0 GHz. Core steppings: C0 (SLANR). 64-Bit Support: Yes. So if you have any. We will response in 24 hours to resolve the problems. for our request andwe hope you can understand ! 1 X E5472 Processors. ETA 3 to 6 Weeks. 1 X E5472 Processors. ETA 3 to 6 Weeks. Product Specification. Series: Xeon. FSB: 1600 MHz. CPU Socket Type: LGA 775. 64-Bit Support: Yes. Virtualization Technology Support: Yes. In most cases, you will receive your item(s) earlier than expected. Your patience is truly appreciated. Trending at $33.69eBay determines this price through a machine learned model of the product's sale prices within the last 90 days. 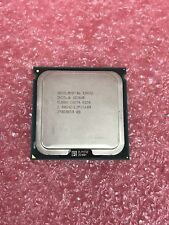 Xeon E5472 Processor 3.0GHz/12M/1600 Works on LGA 775 mainboard no need adapter close to LGA775 Core 2 Quad Q9650 CPU. Model Number: E5472. Interface Type: LGA 771. Socket Type: LGA 771. 64-Bit Support: Yes. Works on LGA775 mainboard no need adapter! This cpu support LGA775 G31/G41/P31/P35/P41/P43/P45 mainboard (Can't support X38 and X48/Q35/Q45/G33/G45/945/965 chip's mainboard). Type CPU / Microprocessor. CODE: SLANR. MODEL: E5472. 12M Cache, 3.00 GHz, 1600 MHz FSB. CODE: SLANR. LOT OF 2 E5472. MODEL: E5472. 12MB Cache, 3.00 GHz, 1600 MHz FSB. Model Number: E5472. L2 Cache Capacity: 12MB. CPU Frequency: 3.0 GHz. New Kingston A400 240GB TLC NAND SATA III 6GB/s 2.5" Internal Solid State Drive●. For Kingston A400 2.5" 240GB SATA III TLC Solid State Drive SSD SA400S37/240G ●. This is an upgrade kit for the 2008 Apple Mac Pro 3,1. One tube of Thermal Paste. One Chempad® for cleaning your heat sinks. One 3mm long handle Hex wrench. Warranty and other info. Model Number: E5472. L2 Cache Capacity: 12MB. CPU Frequency: 3.0 GHz. For Kingston SATA III SSD UV400 2.5" 120GB TLC Internal Solid State Drive (SSD) . For Kingston A400 2.5" 120GB SATA III Internal Solid State Drive SA400S37/120G . Model Number: E5472. Socket Type: LGA 771. We will try our best to solve for your problem. 64-Bit Support: Yes. Number of Cores: Quad-Core. We will try our best to solve any problems. Endding Soon. Model Number: E5472. L2 Cache Capacity: 12MB. CPU Frequency: 3.0 GHz. Power: 80 W. Core steppings: C0 (SLANR). Orders will be processed instantly and dispatched in 24 hours normally, so we do NOT accept any requested note before or after you place orders. Model Number: E5472. CPU Frequency: 3.0 GHz. New For Dell Venue 8 Pro Win 8.1 5468W FPC-1 LCD Touch Screen Digitizer Assembly. new arrival. Core steppings: C0 (SLANR). 64-Bit Support: Yes. Application: Desktop.